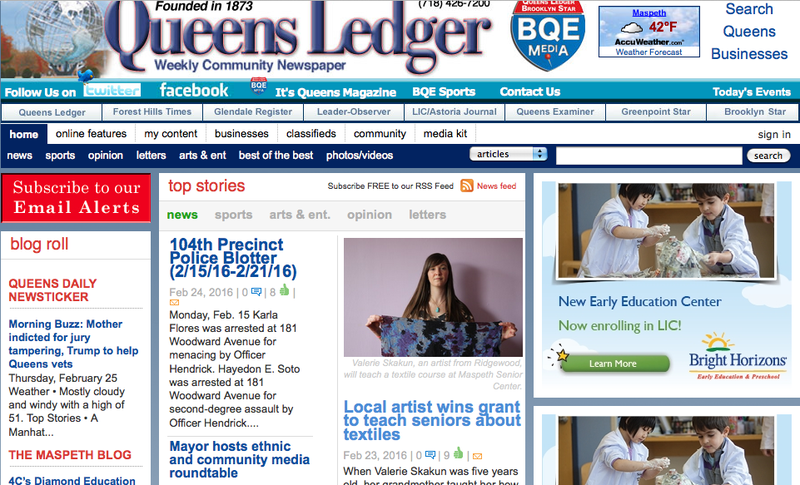 Check out this article written about me, my textiles, and the class I will be teaching at the Maspeth Senior Center, published in the Queens Ledger! I was awarded a grant from the Queens Council on the Arts to teach an art program to seniors in Maspeth, New York. The grant is funded by the New York City Council, The New York Department of Cultural Affairs, and The New York City Department for the Aging. Please share this with any seniors you know who are interested in a textile class in Maspeth, Queens. I am very honored that I have the chance to teach such an amazing class!!! Update your spring wears with these colorful necklaces ! !!!!!!!!!!!!!!!!!!!!!!!!!!!!!!!!! 50 % OFF OF EVERYTHING !!!!!!!!!!!!!!!!!!!!!!!!!!!!!!!! !